The 3 bedroom, 2 bath log home with stocked fish pond. This property has everything you could want if you're looking for privacy and only about a minute walk to federal land at the Blue Ridge Parkway. A side view of the log home. This 3 bedroom, 2 bath log home with towering stone fireplace is very private, yet only a few minute walk to historic Mabry Mill on the Blue Ridge Parkway, where you can enjoy breakfast or lunch at the grist mill. It comes with everything you need to enjoy life in the mountains of Virginia. 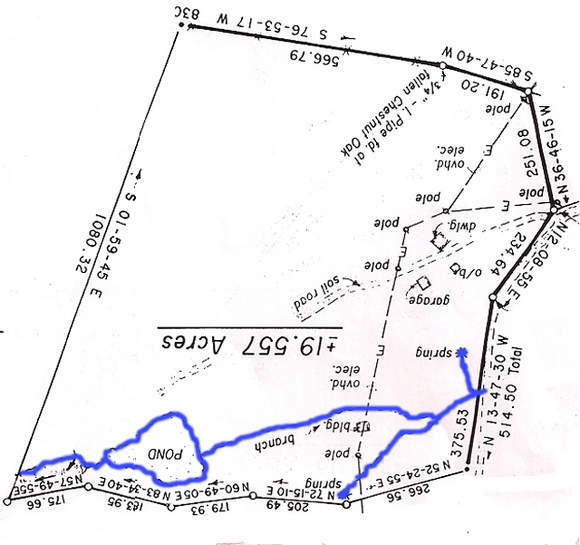 The 19.557 acres has a few open acres and the balance is wooded. There is a stocked fish pond with two docks and a picnic table to enjoy the cool summer evenings at an elevation near 3,000 ft. The woods are abundant with massive trees, rock formations and lots of wildlife. This is about as close as you can get to the Blue Ridge Parkway without actually joining it. There is a long private gated drive where you forge a crisp clear mountain stream. The cabin is rustic and comes almost completely furnished and ready for you to spend long weekends to get away from the hustle and bustle of the city life. Sit on the large front porch and watch deer and turkey feed in your own front yard. There is also a large garage on the property with electricity, water and a concrete floor. It's great for a workshop or to park your prize possessions in. There is also an outbuilding that works great for extra storage or a play house for your kids. This is a beautiful setting in a quiet, rural setting. Another look at the cabin. A look through the mature trees. Post and beam construction on the side porch. The living room with stacked stone fireplace. Enjoy your picnics by the stocked pond. A view of the ponds and two docks. The wood-lined road leading to the pond. The crystal clear mountain stream. The clean woods with mature woods. 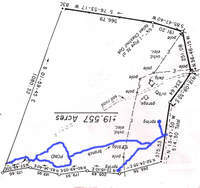 A plat of the 19.557 acres. The blue represents water.